It is about time to come back to serious business, isn’t it? When did I talk about chocolate last? Already a month ago? Even longer, non ? No matter how long, I will not wait for much longer. We all need chocolate. We all want chocolate. And if you don’t, well this is simply where you and I are different. A life without chocolate, or without playing with soufflés, would just not be the same, and I know that I am not alone to feel this way. Many people find the experience of making a soufflé difficult or nerve-wrecking. Some worry that their soufflé will never rise while others are distraught that the soufflé needs to be perfectly timed to be served on the table. This is fair enough: soufflés are whimsical and play tricks whenever they please. They often fall almost as quickly as they rise. They are the boss; I have had a few misadventures and frustrations with them too, trust me. But how much fun they are to make and eat, we agree, don’t we? It was meant to happen. Since I had not eaten chocolate in over a week, I played with the idea of not only eating some again, but I baked a chocolate soufflé. I infused milk and cream with cardamom and used a chocolate high in cocoa contents, such as 70 to 73%. The first time I tried my recipe, I baked small soufflés in the hope that I would eat less of them. It did not happen: I ate just as much, even more. The second time (last night), I baked a big soufflé at my parents-in-law’s in Chicago, when P.’s Irish relatives visited from Dublin — and I used New Tree 73 % dark chocolate. We liked it so much that I was told that it would count as a rehearsal for the dinner I was asked to cook for New Year in Dublin. Yes, uncle Nev. decided that he wanted me to cook a French meal! In exchange, he will teach me how to fly fish for trouts and salmons in Lake Corrib, near Galway. He promised. I promised too. And I cannot wait for both to happen. Especially the fishing, as a matter of fact. Perhaps I can even pack deflated soufflés with us, if Nev. is good! We will like them just as much. Grease 6 small soufflé molds* and coat them with sugar. Remove excess. Keep. Split the vanilla pod open, and scrape out the seeds. Heat the milk and cream with the vanilla seeds, vanilla and cardamom pods. Stop the heat, cover and infuse for 15 min. Strain. During this time, melt the chocolate in a double-boiler, and keep. Beat the egg yolks with half of the sugar until light in color. Add the cornstarch, then slowly pour the infused cream/milk. Pour into a pot and while stirring, heat to thicken, never letting it boil. Stop immediately. Add the melted chocolate to the cream and stir to get a smooth texture. Beat the egg whites firm, with a pinch of salt. When almost firm, add the rest of the sugar and beat to get a nice smooth texture. Fold the egg whites into the chocolate cream, keeping it light. Divide this preparation between the molds. Cook for about 20 to 25 min (never open the oven). Sprinkle with confectioner’s sugar and serve immediately. *If you decide to only use one large dish, increase the cooking time by at least 10 to 15 more min. Beurrez 6 petits moules à soufflé*, et saupoudrez-les de sucre. Réservez. Chauffez le lait et la crème avec la vanille et les capsules de cardamome. Arrêtez le feu, couvrez et laissez infuser 15 min. Filtrez. Pendant ce temps, faites fondre le chocolat au bain-marie et réservez. Fouettez les jaunes d’oeuf avec la moitié du sucre jusqu’à blanchiment. Incorporez la maïzena, puis versez le mélange crème/lait parfumé en filet. Versez dans une casserole et tout en remuant, faites épaissir sans jamais laisser bouillir. Arrêtez de suite. Ajoutez le chocolat à la crème infusée, et lissez. Montez les blancs en neige ferme avec une pincée de sel. Ajoutez le reste de sucre juste avant la fin. Ajoutez les blancs en neige à la préparation précédente en faisant attention à ne pas faire retomber la masse. Cuisez pendant 20 à 25 min (n’ouvrez pas la porte du four avant). Saupoudrez les soufflés de sucre glace, et servez-les de suite. *Si vous utilisez un seul grand moule à soufflé, augmentez le temps de cuisson d’au moins 10 à 15 min. Je te chipe la recette. A la maison c’est le chocolat et en soufflé c’est extra…Bonne journée à toi et à bientôt. cardamome et chocolat.. voici une éternité que je souhait goûter, je suis déjà fan du mélange chocolat/baies roses ou chocolat coriandre… et ces soufflés, tu as raison, une vie sans chocolat… n’est pas une vie! sounds wonderful, I have yet to try making souffles. There are those red spoons that I love of yours! Your souffles look great, and they behaved well for the photos. Béa I don’t know where to go first here. Chocolate and cardamon! Bring it on for me! Lovely. I think you have to just try a souffle or two and the fear is rapidly replaced with joy. The fall of a souffle is just part of the rise. And dad gum you’ve got more of these incredible little bite dishes! And the red spoons! Red, I love red and those spoons are just far out cool. Un vrai délice tes photos, ça me fait totalement craquer ! Your soufflés look incredibly delicious and adorable Bea! I love chocolate and cardamom together. My soufflé success rate so far is 1/3, but I intend to up that number. Pour 6 personnes : 220 g de bon chocolat noir, 4 œufs, 50 g de sucre, 20 cl de lait, 25 cl de crème liquide, 1 c. à café de café soluble, 5 gousses de cardamome. Casser le chocolat en petits morceaux. Les déposer dans un saladier avec le café. Faire chauffer le lait avec la crème. Ouvrez les gousses de cardamome. Mettre les graines dans une poêle et les faire griller quelques minutes à feu vif. Les écraser avec un petit pilon ou un verre. Verser la poudre dans le mélange lait-crème. Couvrir et laisser infuser 5 minutes. Fouetter les jaunes d’œufs et le sucre jusqu’à ce que le mélange blanchisse et double de volume. Verser le lait parfumé bouillant toujours en fouettant en ayant pris soin avant de filtrer le lait dans une passoire très fine pour enlever le maximum de graines de cardamome. Reverser la préparation dans la casserole. Faire épaissir à feu doux, tout en mélangeant et sans laisser bouillir jusqu’à ce que la crème nappe la spatule. Verser la crème en deux fois sur le chocolat et mélanger jusqu’à ce qu’il soit fondu. Couper les écorces d’oranges en très petits morceaux et les ajouter à la crème. Répartir dans des coupelles ou de jolis verres et placer au moins deux heures au réfrigérateur. Servir frais. Ah Bea, tu as raison, les souffles sont capricieux, mais si delicieux. Tu vas pecher le saumon a Noel? Tu nous rameneras des photos dis? I just bought a souffle dish, so I’m steeling myself to take the plunge. I’ve already resigned myself to some mishaps, but I really want to succeed when I make this soufflé. I can already taste the chocolate and cardamom. I’ll have to make some practice soufflés, because I don’t want to mess THIS one up! I love these – fantastic photos. Where did you get these cups for baking the souffles in? I have been looking for something like that! Those cups appear to be a popular choice – everyone I know is picking them up! Your souffles look lovely in them! I’m having people over next Friday and haven’t decided on dessert yet, Bea – tks for the inspiration! Ah, gorgeous as always, Bea. You and I are different, as I am not such a fan of the chocolate, but I can still appreciate the beauty of such a dessert. 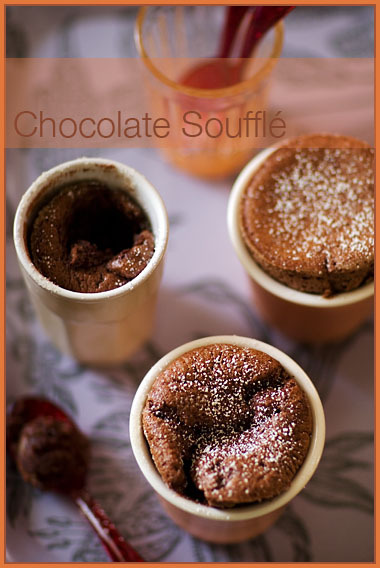 il faudra que j’essaie ces beaux petits souffles tout choco…. Oooh . . . I’ve been searching for a chocolate dessert to serve for Christmas that would be decadent, but not deadly and I love the idea of this souffle — the cardamom is such a neat touch! And the crab and saffron souffle . . . two days before the opening of Dungeness crab season here in California . . . I know what I’ll be having THIS weekend! By the way . . . if you haven’t already, please check out http://www.generouspour.com to help me and Clos du Bois raise money for Share Our Strength. You don’t have to buy anything, pay anything or even do anything — other than download a cool song by Corinne Bailey Rae and pick up some new holiday recipes. Thanks! Please share where you got the cups too! An excellent way to utilize one of the spices I have but usually only think of it when I cook Indian!! Thank you! 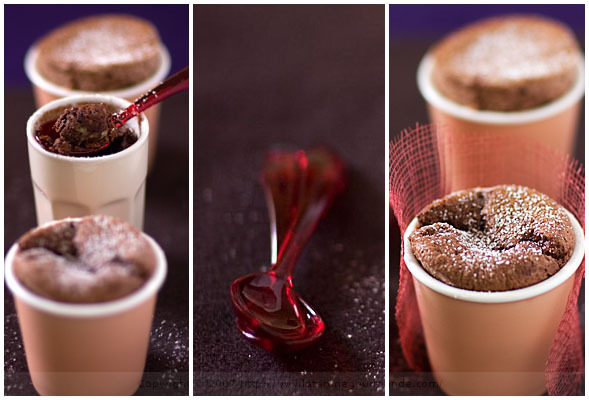 New Years in Dublin and fly fishing sounds like a fair trade for your wonderful chocolate souffles! Je sais pas si c’est moi, mais j’adore les souffles tout raplatis…ca me fait pense a un croisement entre un brownie et un pot de creme…J’essaie les petites portions mais je finis toujours par en manger plus!! Definitely nerve-wrecking as you say…especially living in an apartment building with all sorts of sudden movements, shakings and noises…but oh, so dreamy and worth it! ha, my soufflé-karma seems to be a good one. I started doing them initially this year (finally my new oven has a window) and so far I made a lot soufflés in every combination my pantry offers to me. It’s just important to lubricate the molds real proper, I guess. The cardamom would make this a fantastic winter warmer souffle. I’m sure it will be a huge hit over New Year’s. They look so wonderfully delicious. I just bought myself a large souffle dish/ramekin. Do souffles behave the same in individual (small) and large ramekins? Very interesting, I have never seen a souffle made this way, the method reminds me of making the pastry cream! I have posted the best souffle recipe like 2 months ago, and that one I learned in school, which is actually a french recipe and it works beautifully! When our chef was making a demo he even said ”Look! I will open the oven and nothing will happen!” And so it was. Stunning. Thank you very much everyone for your encouraging and friendly comments. What would I do without you? As to the cups, since many of you asked, they were purchased a while ago in (early summer) a local store in Boston, but you can purchase them on line as well. The name of the company is ASA. So check with them, and good luck! Answer to question about size. Yes the souffle behaves the same, except that it seems to rise more in a smaller cup. And of course, if using a large mold, prolong the cooking time. Hope this helps, and have fun with them. Because they are really fun to make, watch rise too, n’est-ce pas? Also, in answer to Gracianne’s question about the fish, I was told by uncle Nev that it is best to go trout fishing in May. So even if we will be in Dublin in December, I will have to wait May to actually go fishing. I guess it means another trip, no complaint there. This lake is one the biggest in Northern Europe, and the scenery seems stunning. The Connemara is a beautiful region. Ils sont terribles ! Je veux les mêmes !!! Merci Béa pour toutes ces idées. Chocolate soufflé is exactly what I want when the weather turns gray. Always has been. This a true November treat for me. Looking at the photos is almost – almost! – enough. Thank you for that treat, Bea. I love making souffles, but often do savory ones. I’ve never actually make a simple chocolate souffle. I like your recipe with cardamom and bittersweet chocolate, so I’m going to hang onto it for when the occasion arrives. I LOVE cardamom and dark chocolate. And it just looks so wonderful! I definitely will cook it at the upcoming weekend. This is a terrific recipe. Tried it tonight as my first soufflé experiment. Rose perfectly, with the full flavor of the chocolate and the cardamom. I added some vanilla liqueur and homemade dark chocolate sauce over top the finished product for some extra awesome. Thanks for posting it! I realize its been a bit since you posted this but I wanted to let you know that I too tried this as my first ever attempt at a souffle and it was excellent! Very impressive, tasted great!! Souffle never works out for me.. I’m gonna try this one.. hope it rises without collapsing a second later! what are those cups? are they paper? where can i get them? Bake for 20-25 minutes ? For a tiny souffle ??? Impossible, unless you want to ruin it. I suspect 10-15, at most. Also 350F seems low. The suggested baking time makes me distrust the recipe.